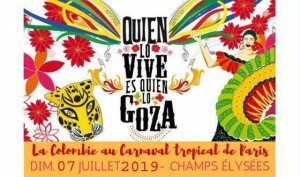 The Carnival will take place at the Champs Elysées on 7 July 2019, the theme of which is: the madness of the tropical Carnival of Paris. 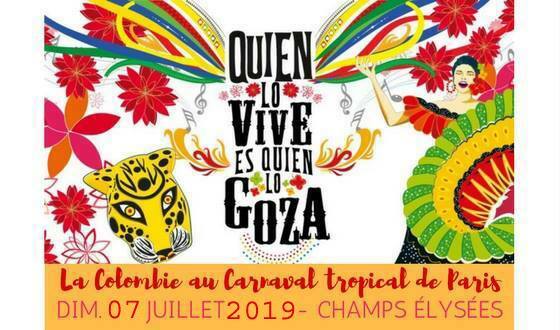 We participated the year 2017 being devoted to "the year of Colombia in France", we are particularly honoured to represent for the second time the Colombian culture, on the occasion of this Carnival. We are pleased to invite all those who would like to join us and participate in our parade. To do this, there is no need to be a member of academia Maritza Arizala! All those who want to express their joy of life will be welcome regardless of their age and their level of dance. To accompany us, you just have to be motivated and want to share. The theme that we have chosen to represent will be "the folly of the mother of the forest," "la locura de la Madre Selva". The choreographic direction will be entrusted to the first Colombian Salsa school in Europe in Paris: the Maritza Arizala Academy. Students, friends, admirers of Colombia, Hispanics, men, women, children, adults and teenagers, you are all invited to join us for this moment of Franco-Colombian sharing, and we await you, many!!! We appeal to the Colombian and French communities to lend a hand and support us with their donations in the form of money or advertising objects. We would be delighted, of course, to welcome any artist willing to offer us his participation. Any company that would support us will have to send us its logo which will be inserted in the Calico of our Association. All promotional gifts will be widely distributed on the parade route (according to the CG of the Paris Federation). • Participate in all rehearsals programmed in June which are obligatory, (mini of 3/4). Sunday 3O: General rehearsal with costumes. Sunday 7 Carnival. 1Oh3O-7pm. Avenue Les Champs Elysées. Commit to wearing the costumes (Fandango y cubia or Indios farotos) loaned or rented by the Association. Small reminder: it is not necessary to have a high level in dance the Academy will teach you the basic steps and the taste of the rhythm indispensable in a parade. Quien Lo Vive es Quien Lo Goza!! We're expecting a lot of you! www.maritza-arizala.com Tel 06 88 06 78 70. We expect many of you!